Rain's Embellishments: All Hail the PunK RoCk PrOm KING!!! Saturday night was Punk Rock Prom with Flogging Molly! Our local radio station KWOD was having a contest for prom king and queen. So Chris & I got all dressed up (I wore a pink sugar skull dress my mom made, and Chris wore a matching vest that I did...along with me liberty spiking his hair) and entered the contest! After mingling with friends for a bit we headed back to the KWOD tent to see how we ranked. Unfortunately they were not judging by couples...and I did not rank within the top three gals! Fortunately, Chris did rank within the top three guys! So they teamed up three guys with three gals and then walked them up to the stage for the competition. They got scored by the crowd. Whoever got the largest amount of cheers won! Chris & his partner had the most crowd response & won the $500 prize along with being crowned! 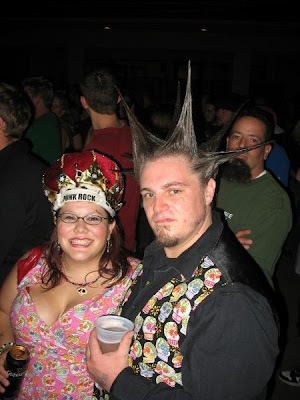 Unfortunately, Chris' spiked hair made it impossible for him to wear his crown. So I got to wear it for the night! That looks like so much fun!!! Good job on his hair! Love the matching dress & vest, of course!